Note: One adult must be selected and the cheapest ticket is free. Price is subject to change - From £26*. ZSL London Zoo is inviting children to become zookeepers this Easter - at Mini Keepers, a fun packed role-playing experience for junior animal lovers. From Saturday 6 to Sunday 21 April, kids will be able to step into the role of a zookeeper at ZSL London Zoo, during a packed Easter of immersive family events celebrating their incredible work. Come face-to-face with some of the hairiest, scariest, tallest and smallest animals on the planet with the ultimate back-to-nature experience. By pre-purchasing your ticket, you can avoid the pay lines outside and head straight in to enjoy the historic zoo set in central London’s leafy Regent’s Park. With more than 800 amazing animal species to discover, as well as live talks and fantastic, immersive exhibits, London Zoo is the perfect place to spend a day away from the hustle and bustle of the city centre. Embark on a journey through an Indonesian habitat at Tiger Territory, getting up close to beautiful Sumatran tigers via floor-to-ceiling glass windows, bringing you closer than ever to the environment of one of nature’s most awesome predators. Marvel at London’s largest colony of Humboldt penguins as they dive, swim, frolic, and feed. 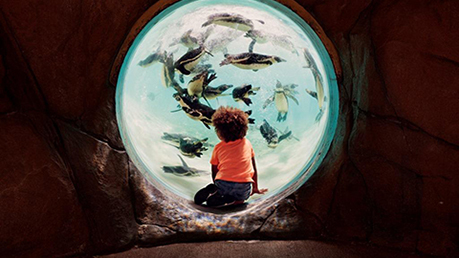 And don't forget an awesome selfie at the iconic underwater bubble for a penguin-eye view of their watery home. Move through lush, leafy pathways and come face to face with the majestic Western lowland gorillas in the large Gorilla Kingdom. Before you leave, don't forget to visit Land of the Lions. Home to a pride of endangered Asiatic lions, the Land of the Lions exhibit features an awe-inspiring look at these big cats as they explore an amphitheatre-style enclosure made to resemble a crumbling ruin. Opening and closing times may vary. Please check website for details.